Yoga Yard was founded in August, 2002 by Mimi Kuo-Deemer and Robyn Wexler as a center for yoga and healing. At the time, the only yoga taught in Beijing was inside sports centers and gyms -- environments not always conducive to quiet or relaxing practices. By starting Yoga Yard, we sought to build a school based on principles of health, mindfulnenss, safety, dedication to quality teaching, commitment to support our students and teachers, and most importantly, a love of yoga. Yoga Yard is founded on a love for yoga and the joy the practice can bring. High-quality teaching, an emphasis on safety, and a deep respect for the practice underlie our school’s philosophy. We are committed to supporting students as they explore and grow their yoga practice, and welcome everyone regardless of age, gender, experience, level and physical condition. Through proper practice of yoga asanas (postures), classes at Yoga Yard help detoxify the body and strengthen muscles. The practice of Yoga asanas also helps improve flexibility, nourish the organs, and bring balance to the nervous system. This process uncovers greater physical ease and well-being. However, the physical aspect of Yoga is just one part of a far richer philosophy and life practice that aims to improve mental and spiritual health. We believe the practice of yoga ultimately encourages students to experience more stillness, clarity, and inner-joy. At Yoga Yard, we offer different level classes so students can explore and deepen their practice according to their experience and needs. Modifications and options are given to ensure that all students practice in a safe and appropriate manner. We use the breath as a vehicle to focus the attention and guide our physical movements. This physical practice encourages us to engender greater awareness and self-understanding. The focus on our breath and bodies allows us to become more sensitive to how we are during our time on the yoga mat, and ultimately how we live our daily lives. As we develop awareness and release untapped potential, we experience the transformative nature of the practice. This is one of Yoga’s true gifts. Why the name Yoga Yard? Yoga Yard was born inside the walls of the Dowager Empress’s brother’s former courtyard home. We chose the name Yoga Yard for the fitting location of our origins, as well as the easy translation into Chinese— “Yujia Yuan,” or “the courtyard of Yoga.” We had a lovely space inside the main hall, with high ceilings and south facing windows. The neighborhood where the courtyard stands was undergoing extensive demolition. 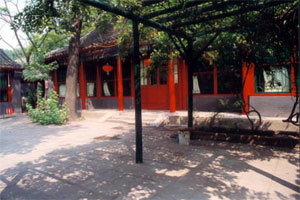 Though the courtyard itself was protected, in September, 2003, the studio was reclaimed and converted into a Chinese restaurant. We then moved to our second location near the Lama Temple, where we taught classes for nearly three years. Yoga Yard Today. Today our studio has moved to the Sanlitun district. We offer more than 50 classes per week from introductory to intermediate/advanced, as well as restorative, meditation, chanting, and pre- and post-natal classes. Classes are small, which encourages more personal dynamics between teachers and students; on average they range from 6-20 people. With a staff of 16 bilingual teachers (English and Chinese) and an expanding community of international teachers who visit Beijing to share their knowledge of Yoga, our school will continue to explore the joys that this sacred practice can bring with the greater Beijing community.